It isn't every city that can immortalize itself in the form of a monumental reference book encompassing details of all of the major and most of the minor figures and events of the community's existence. In fact, it wasn't any city—until the 1987 publication of The Encyclopedia of Cleveland History. The brainchild of co-editors David D. Van Tassell, Ph.D., and John J. Grabowski, Ph.D., the 1,128-page tome was a watershed of popular historical research. It looked at the life of a city in a way that had never before been attempted, bringing together in one volume an immense amount of information from an enormous number of disparate sources, presenting that information in language that was easy to read and understand, and making genuine historical scholarship accessible to the broadest possible audience. It also prompted a number of other cities— including Indianapolis and New York— to pursue similar publications of their own. Some of the encyclopedia's articles were written by Van Tassell, Grabowski and other professional historians, but most were produced by a small army of amateurs that the editors assembled and trained. Both men were more than prepared for the task: Van Tassell was chairman of the department of history at Case Western Reserve University (and founder in 1974 of the “National History Day” event), while Grabowski was director of research at the Western Reserve Historical Society, the archival repository of much of northeastern Ohio's documentary and photographic history. Together, the two guided the creation of the encyclopedia from conception to publication, reading and re-reading every word in it, making editorial suggestions and decisions and overseeing the compilation of all the text, photographs, maps and charts that the encyclopedia required. Before the advent of the encyclopedia project, Clevelanders seldom had an opportunity to consider the totality of their community, from its birth and vibrant adolescence through what can only be called its turbulent maturity. Coming in the wake of the 1970s— a decade that saw racial unrest, outward migrations of business, industry, and population and the first municipal default in the U.S. since the Depression— the encyclopedia reawakened a sense of civic pride among Cleveland residents, who for the first time could find in a single resource the stories of their predecessors: all the worthy individuals, families, organizations, corporations, political leaders and public institutions that had shaped the community they called home. Originally envisioned simply as an historical reference tool, the encyclopedia nonetheless brought to many contemporary citizens a new awareness of what might be possible in their city. Since its first publication, the encyclopedia has proved to be an invaluable educational asset for the city's schoolchildren. 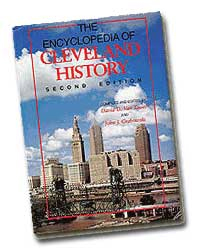 A second edition, released in 1996 to coincide with Cleveland's bicentennial, included updates and revisions to most of the existing material, as well as nearly 400 new articles. Biographies of late Clevelanders were helpefully moved to a separate volume, The Dictionary of Cleveland Biography. 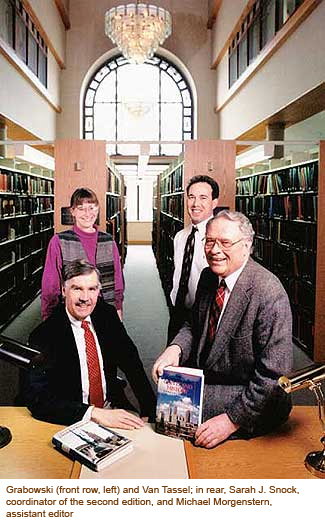 In 1997, Case Western's department of information services put the encyclopedia on the Internet at http://ech.cwru.edu. Established on the Web in an interactive site that allows easy access for researchers and the ability to update entries as required, the encyclopedia continues to evolve in shape, content and direction— just like the city whose history it chronicles. Time magazine was published in Cleveland from 1925–27 in an effort to improve its delivery time to the West Coast. Begun in New York by Britton Hadden and Henry R. Luce in 1923, the fledgling “Weekly Newsmagazine” was often reaching western subscribers 3 days behind schedule. Luce made the decision to relocate in Cleveland during his partner's absence in Europe. In order to save the company from responsibility or moving expenses, editorial employees were dismissed in New York on 17 Aug. 1925 but were promised reemployment if they applied in Cleveland on 19 Aug. Time's first Cleveland issue appeared on 31 Aug. 1926, printed at the Penton Press at W. 3rd St. and Lakeside Ave. . . .One windfall from the move was approval of the magazine's application to the U.S. Post Office for reclassification as a weekly newspaper, which made it eligible for priority handling; it had been unsuccessful in its attempt to win this favor in New York. Time's renewed application was helped by the sponsorship of the Cleveland Chamber of Commerce and Congressman Theodore E. Burton. Time's founders were divided in their feelings toward their new home. Cleveland provided the China-born Luce with an American hometown he had never had, and he comfortably settled with his young family in Cleveland Hts. To the bachelor Hadden, Cleveland was a bastion of Babbitry only slightly ameliorated by the opportunity it afforded him to organize his own sandlot baseball team. Citing Cleveland's remoteness from news sources, Hadden took advantage of a European vacation by Luce to move the editorial staff back to New York in the summer of 1927. Cleveland had been good to Time, nevertheless. Circulation climbed from 70,000 to 111,000 during the Cleveland years, and the magazine's cover also acquired its distinctive red border at the Penton Press. During a cash-flow crisis at the end of 1925, an overdraft granted by Central Natl. Bank had enabled the magazine to meet its payroll until holiday subscriptions replenished its coffers. Although Time moved its printing facilities to Chicago shortly after returning the editorial department to New York, it continued to deposit its circulation receipts at Central Natl. through 1983. Semenoff, Nikolai Prokofievitch (12 Mar. 1881–7 July 1932), once ballet master of the Imperial Moscow Theater, conducted a dance studio in Cleveland in the years prior to his suicide in protest of the "slander and persecution of the ballet.” A native of Moscow, he graduated from the Imperial Russian school in 1899 with the title of “artiste.” After working as a ballet master with the Moscow Art Theater, he joined Serge Diaghileff's Ballet Russe, serving as regisseur, or administrator, for choreographer Michel Fokine. Prior to the Russian Revolution in 1917, he was ballet master at the Imperial Moscow Theater. Semenoff, who claimed that his entire family was killed by the Bolsheviks, fled from Russia in 1921. He walked across Poland and eventually reached Paris, where he remained 2 years. He arrived in the U.S. in 1923 as a member of Nikita Bialeff's Chauve-Souris, a touring Russian vaudeville show. Semenoff came to Cleveland in the mid-1920s to conduct the Martha Lee dancing school. Within 2 years he opened his own studio, the Imperial Russian School of the Dance, in Carnegie Hall on Huron Rd. He faithfully patronized local cultural events and placed ads in concert programs. By the early 1930s, however, his livelihood was threatened by the Depression and the vogue of modern dance. Semenoff was dismayed by the opening of a modern dance department at the Cleveland Institute of Music and the commissioning of modern dance choreography by the Stadium Opera Co. After closing his dance studio, he poured out his frustrations in a letter to Fokine and threw himself over Niagara Falls in Canada. He left no survivors, nor was the body recovered.